Baker, Martin S. 1217 N. New Jersey Indianapolis, IN. Cowan, Percy Orrington Hotel Rm. 200,209 S. La Salle St. Chicago, IL. Curry, William 533 Ave. "K" Boulder City, NV. Fox, Ray V.A. Domiciliary Center (Co.#2) Clinton, IA. Gartner, Al. 1213 Balboa Ave. Burlingame, CA. Gill, Frank 1412 E. Market St. Indianapolis, IN. Golatka, J. 1066 Lafayette La Salle, IL. Hansen, Edward Box 67 Elberon, IA. Harrison, Nels J. 2230 W. Grove Blue Island, IL. Hutchine, F. O. R.F.D. 3 Lake Mills, WI. Keating, Walter " " " " " " " "
Kotoed, Cris 13341 S. Lakkewood Paramount, CA. Lawrence, Larry c/o Milwaukee Journal Milwaukee, WI. Mattarelli, Vincent 212 Charleston Peoria, IL. Mortenson, H. B. (Mort) 2221 "O" St. Sacramento, CA. McMurray, Jess Box 155, Route 6 2027 Will-o-Wisp Way Alto Woods Park Jackson, MI. Sneed, James Fort Pierce, FL. Wilkinson, R. B. Graybar Electric Co. 420 Lexington Ave. NY, NY. World, Percy 1585 Ridge Ave. Evanston, IL. Sparmacher, Sol Editor of chips for M. Co.
Hausman, Jim " " "
Carry this list with you on your trips and vacations and contact the boys on your route. Always welcome at an M. Company Buddies home. When in their town call them or make a contact. It's a real pleassure as you know. Write often, give any changes of address, phone No. etc. and if an unlisted phone on our roster, write so we can add it. In case you hear of any news of a Buddy, especially one who has gone West, let us know. Copyright � April 19, 2003- Laura J. Stewart - All rights reserved. 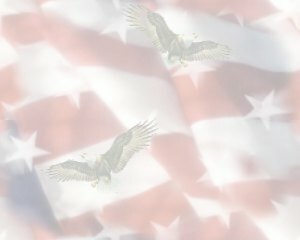 In memory of my father, Homer Harland Stewart. 131st Infantry - Company "M"
The following is a list that was in the possession of my father, Homer Harland Stewart. (I am including SSDI information when I can find it. *LSC ) I thought this might help someone trying to prove their loved one was in WWI & since most of the Army's papers were destroyed in the fire at St. Louis, MO. This page created on April 19, 2003. Last updated on August 11, 2005. Lineage of the 131st Infantry by MSG Jose R. Ramirez Jr.
Mustered into Federal service at Springfield, 13 May 1898 as 1st Illinois Volunteer Infantry; served in Cuba and mustered out 17 November 1898 at Chicago. Mustered into Federal service 26 June 1916 for Mexican Border and stationed at San Antonio, Texas; mustered out 4 October 1916. Mustered into Federal service 4 April 1917; drafted into Federal service 5 August 1917. Redesignated as the 131st Infantry and assigned to the 33d Division 12 October 1917. Demobilized 6 June 1919 at Camp Grant, Illinois. Reorganized during June 1919 as the 1st Infantry, Illinois National Guard. Redesignated as the 131st Infantry and assigned to the 33d Division 13 December 1921. Federally recognized 18 August 1922 at Chicago. Inducted into Federal service 5 March 1941 at Chicago. Relieved from the 33d Division 21 February 1942. 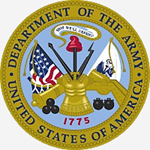 Inactivated 26 February 1944 at Fort Benning, Georgia. Assigned to the 33d Infantry Division 5 July 1946. Reorganized and Federally recognized 20 December 1946 at Chicago. 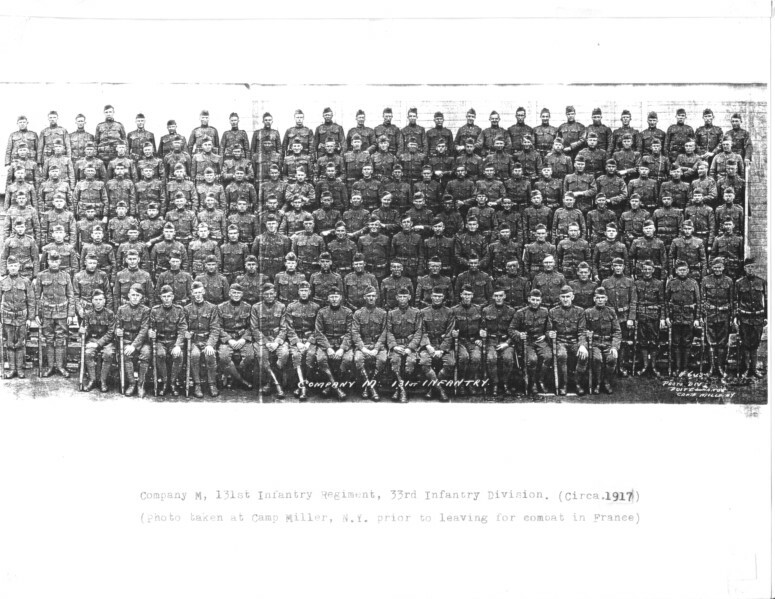 Company M, 131st Infantry Regiment, 33rd Division. Photo taken at Camp Miller, NY. in 1917, prior to leaving for combat in France. From a book of France that my father had written in, states that they arrived at Brest, France in 1918.Photo courtesy of Ken Loh of Lompoc, CA. His father was Russell Loh that is listed on the "Buddy" list. Many thanks to him for preserving this piece of history!